Hard to believe it's been nine years since we opened the cafe doors and started serving up the butterbeer and chai. Golly! Since today is our anniversary we know what that means! We are celebrating the 9th CafeAnonsBall! The one time of year when we celebrate all those folks who drop into the cafe and who's name is only known to God. So to get things started, we need to be sure the pancakes are arriving from the kitchen to all the plates here in the cafe. There are many ways to make pancakes - but just in case you're not sure, here is a short less on making delicious pancakes for Strove Tuesday. For centuries, the English have celebrated Shrove Tuesday, the day before Lent, with merriment and antics and, especially, great quantities of pancakes. In fact, the fried flat cakes became so important to the holiday that is has also been called Pancake Day, or Pancake Tuesday. 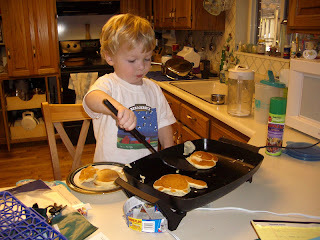 Learning to make pancakes can start early. Long ago, strict Christian Lenten rules prohibited the eating of all dairy products, so keen housewives made pancakes to use up their supplies of eggs, milk, butter and other fats. They could be easily made and cooked in a skillet or on a griddle. Families ate stacks of them, and pancakes were popular with all classes. The pancakes were fried in butter or fat and served flat or rolled and sprinkled with powdered sugar, topped with preserves or doused with alcohol. A special pancake, called a quire or pancake of paper, was made very thin and usually stacked. It was likened to a quire of "wafers" or writing paper. Even the church bells that rang early on Shrove Tuesday morning summoning everyone to confession and to be "shriven" became known as Pancake Bells. They also reminded all to use up the "forbidden foods" before Lent. An old London rhyme went "Pancakes and fritters, say the bells on St. Peter's." Shrove Tuesday was once known as a "half-holiday" in England. It started at 11:00 am with the ringing of a church bell. On Pancake Day, "pancake races" are held in villages and towns across the United Kingdom. The tradition is said to have originated when a housewife from Olney was so busy making pancakes that she forgot the time until she heard the church bells ringing for the service. She raced out of the house to church while still carrying her frying pan and pancake. 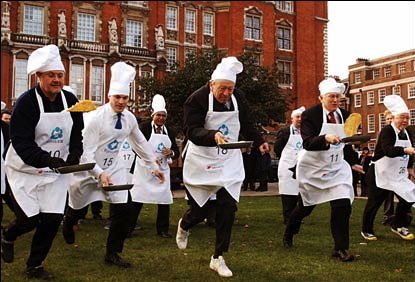 The pancake race remains a relatively common festive tradition in the UK, especially England, even today. Participants with frying pans race through the streets tossing pancakes into the air and catching them in the pan whilst running. The most famous pancake race, at Olney in Buckinghamshire, has been held since 1445. The contestants, traditionally women, carry a frying pan and race to over a 415 yard course to the finishing line. The rules are strict: contestants have to toss their pancake at both the start and the finish, as well as wear an apron and a scarf. Traditionally, when men want to participate, they must dress up as a housewife (usually an apron and a bandanna). The race is followed by a church service. Since 1950 the people of Liberal, Kansas, and Olney have held the "International Pancake Day" race between the two towns. The two towns' competitors race along an agreed-upon measured course. The times of the two towns' competitors are compared to determine a winner overall. After the 2009 race, Liberal was leading with 34 wins to Olney's 25. A similar race is held in North Somercotes of Lincolnshire in eastern England. Have you ever participated in a Pancake Race? Here at the Cafe we thought that it would be like a Cafe in real life. Only in Cheers does everyone know your name. In most cafe and pubs - yes, there are regulars who's names are known. But there are many visitors who's name no one ever knows. That's part of the charm of a cafe or pubs—a mix of the known and the unknown. We wanted it to be a place where those on the left and those on the right could meet up and swap howdies. However we didn't want anyone to meet up and swap blows. He has his favorite table by the door. He has a lot on his mind so most often is not easily disturbed. But if things get rowdy, he won't hesitate to get up from his chair and toss someone out the door - or window. Sadly, many time they are the anons—not always—but most often it does seem to their lot in life. Some seem to forget that while we may not know their name (though we might know where they are posting from) someone does know their name. Just saying. 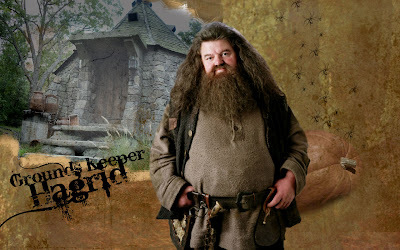 Most of the time—a great deal of the time—Hagrid can just snooze his time-off away and while the conversations may get lively (we are permitted to toss pancakes but not chairs), it most often is still rather cordial. And for that, we are grateful. And so on this day, we say thank you—all you anons (who know who you are), thank you for dropping in, toasting your tankard, speaking your mind and most of the time keeping your cool.